I’ve been on a crafting bender lately. Ok three projects in a year. But that’s a bender for me, I don’t craft. But as Reggie for my muse, I couldn’t help but make these fun things that aren’t (sorry scrapbooking fans) as costly or time consuming as scrapbooking, and are things that I would gladly put in my own house. You will need: cardstock paper (color of choice), non-toxic washable paint (important, and also color of choice), stencils. Easy, easy, easy. In theory. Paint your dog’s paw and print it on the paper. Done. Except that the first time I did it I used too much paint and it was just a black blob, and the second time I did it I had too much paint in his paw hair and it squiggled and looked funny. Third time is the charm! 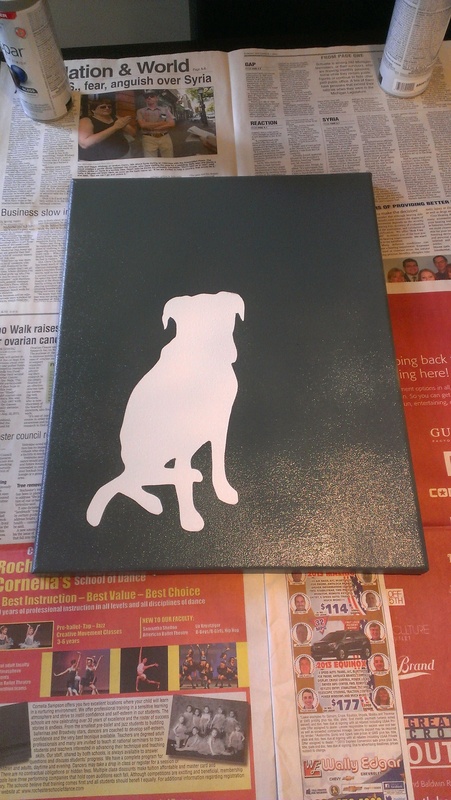 And then you can stencil your dog’s name, a date, a funny saying, whatever your heart’s desire. Reggie was fantastic and just sat there getting pawprinted. Make sure the paint is non-toxic as it can absorb through the paws, and obviously a washable type paint. You will need: empty, clean aluminum can, rolled cork, spray paint (color of choice), shipping labels, paint. Spray paint the inside and outside of the can. Being the overachiever that I am, I used one of Reggie’s wet food cans. Cut the rolled cork to the width of the can- I bought the sticky back kind so I didn’t have to mess with glue. 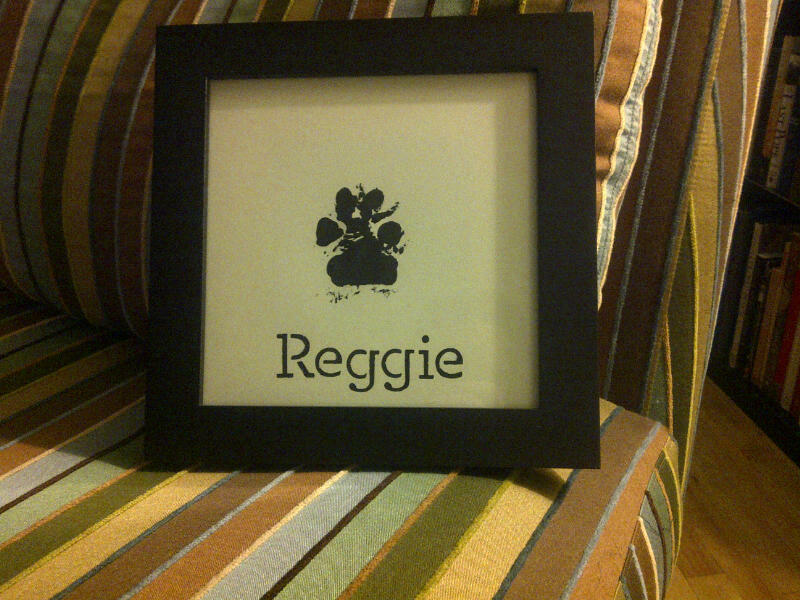 Print a dog picture on the shipping label- again I used a picture of Reggie- but you can use any picture, and cut out to make a stencil. Put the sticky stencil on the cork and paint. Use the paint sparingly because remember the cork is very absorbent and can leak outside the boundaries. You will need: canvas, spray paint (2 colors), shipping labels, contact paper. This took a little more time because I had to take about a hundred photos of Reggie. Paw print no problem. Sit still for a photo big problem. When you get a photo that suits a silhouette print it on the shipping label. I scaled it up a bit to suit the larger size canvas I bought. 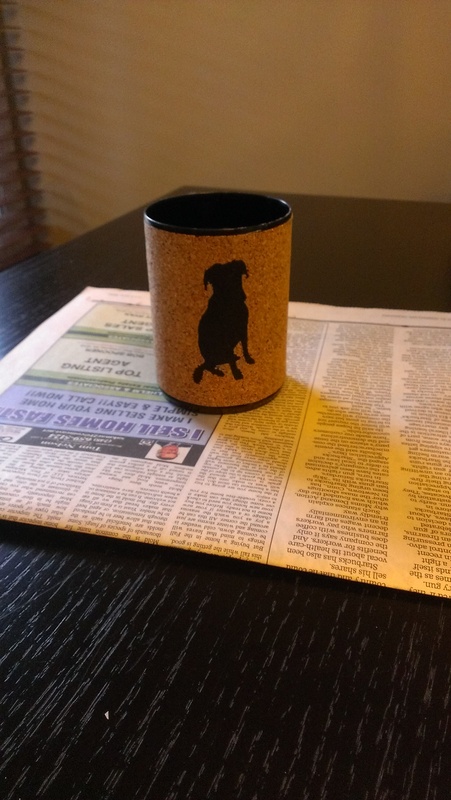 Stick the shipping label to the contact paper and cut out your dog (shipping label doesn’t stick to canvas). In the meantime, spray your canvas with the base color (the silhouette color). 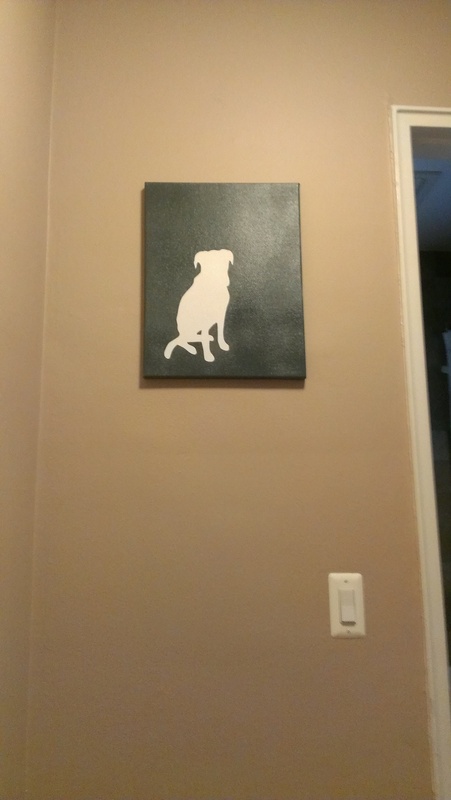 When dry, peel and stick your cut out dog on the canvas. Smooth the edges really, really well. I turned the canvas over and put a book on it for a half hour just so it was stuck really good. Then spray your canvas with the background color. Peel off your sticky dog before it’s fully dry so the paint doesn’t peel. Dog art! ← Can dogs tell time?